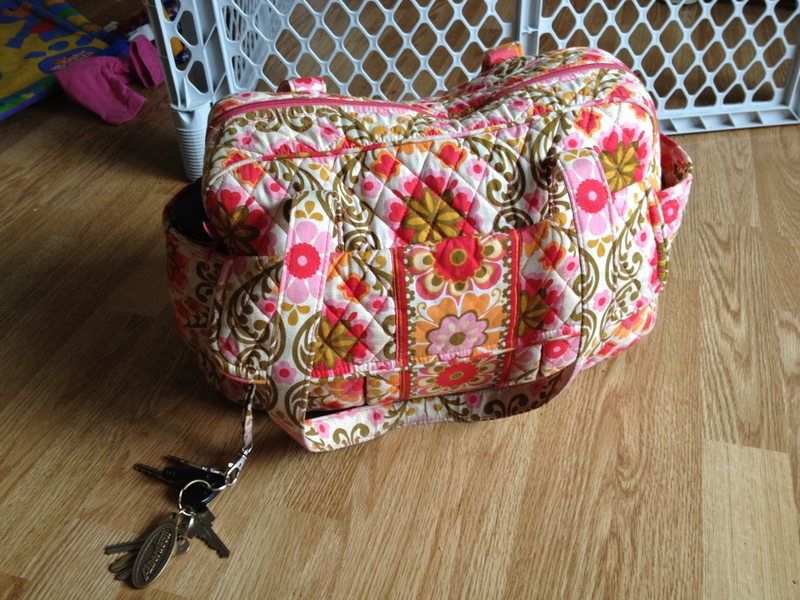 This is my Vera Bradley Diaper bag that I am in love with. I have a bit of a bag obsession, this is my 4th diaper bag in two years. My first one was ugly, my second one was custom made and I LOVE IT, but when I added another kid to the picture it didn’t work for us because it was small, my third one again I loved it but it didn’t fit everything. So I traded a Plum Applecheeks Diaper for this beauty. 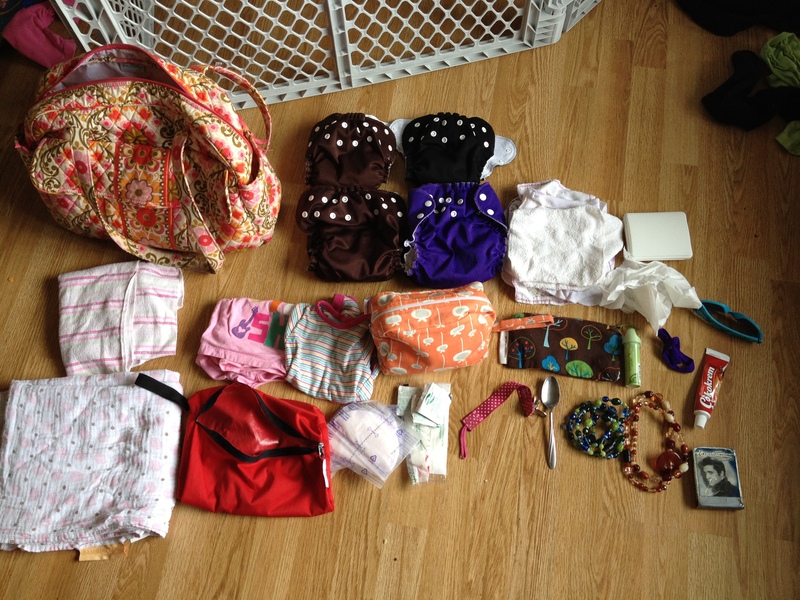 When you cloth diaper you usually need something to fit your needs, just carrying one of those small diaper wallets just won’t cut it, especially when you have 2 in cloth diapers. So I needed a bag that could hold diapers for 2 kids, spit up blankets, extra clothes, snacks, my stuff and the list goes on and on. For everyday use and normal day trips this does great. I am an over packer so I do have a dream bag for longer trips (This Ju-Ju-Be is my dream bag for trips to the children’s hospital for Capri and other long day trips since we travel a lot). 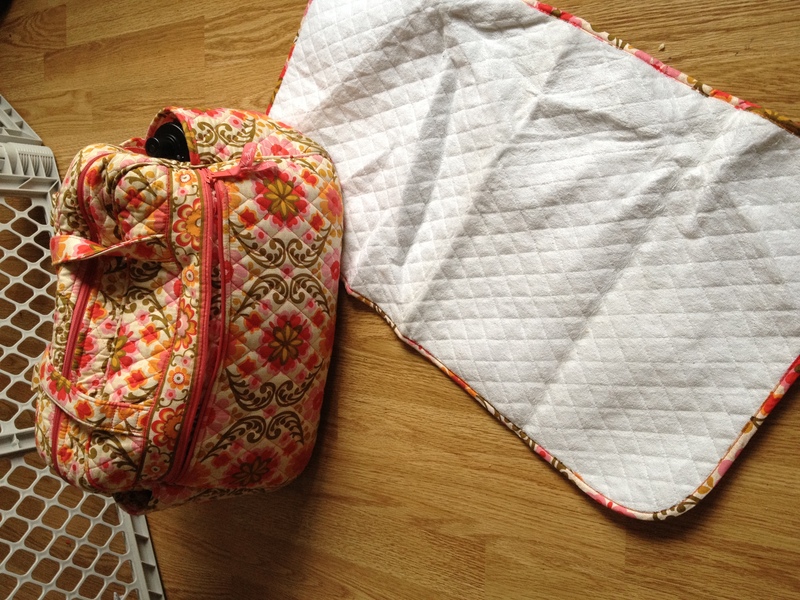 But I need to move on with what is in my Vera. So this is just a regular day in my diaper bag. There are usually 4 diapers (2 size 1 and 2 size 2 Applecheeks), a stack of wipes, a first aid kit, Capri’s sunglasses (she put them in there), a tube of Green Sprouts compressed wipes (they are really small and you add water and they make a wipe), a tube of Nutella (like nutella in a toothpaste tube, from Turkey from a friend), a deck of Elvis Presley Cards, a snack bag from Sweet Jay Creations, a couple of mommy necklaces, a spoon (because you never know when you will need a spoon, I have always carried a spoon in my bag even in high school), my Maxwell Designs Cosmetic Bag which has all my stuff that I want to keep handy (picture below of what is in that), some breast pads because I leak like a faucet, some wet naps for my messy eater, a wet bag, a shirt for Capri and a onesie for Payson, an extra spit up blanket (Payson usually has at least 1 in her carseat), and an extra Bambinoland swaddling blanket. In the other picture you can also see Capri’s Klean Kanteen, which we cannot leave home without because Capri drinks about a gallon of water a day. The bag also has a key chain hook in the front which is PERFECT for me because it helps me keep track of my keys better. In my Maxwell Designs bag I have a notebook, a bunch of pens, my awesome coin bag, my sweet leather card holder, headphones, candies, jump drive, Hylands Teething Gel, Moms Kisses (watch for my review of this awesome product in the next few days) and a lip gloss. 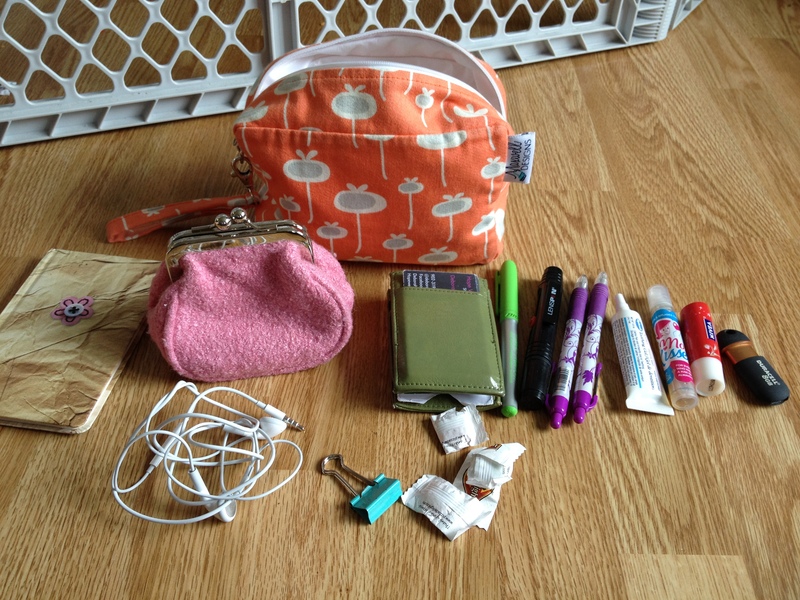 I love having this little bag in my diaper bag because when there is something need I can just grab it. Or if I am going out without the kids I can just take this along with me. I love Maxwell Designs, they also made my Playbook case. This bag has tons of pockets. There are 3 pockets on the front which is where the key thing is, I usually stuff crayons in those or random things I get while I am out. There are 2 pockets on the ends which are a really good size and fit all of Capri’s sippys, and my water bottles. 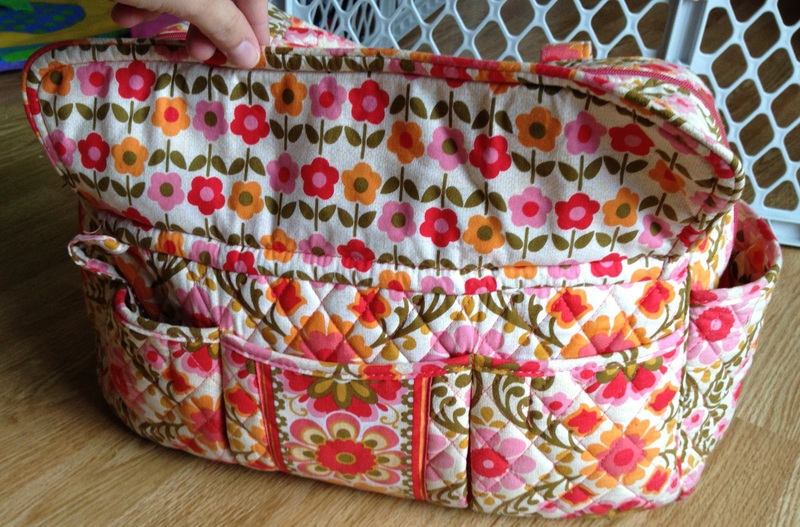 There is a back zipper pocket that has the change mat in it. On the inside there are 3 pockets on one side and 2 pockets on the other, this makes organizing a lot easier. Also the inside of the bag is all wipe-able just in case something spills. So as you can see things don’t have to match for me. I love having all sorts of patterns and designs in my life. 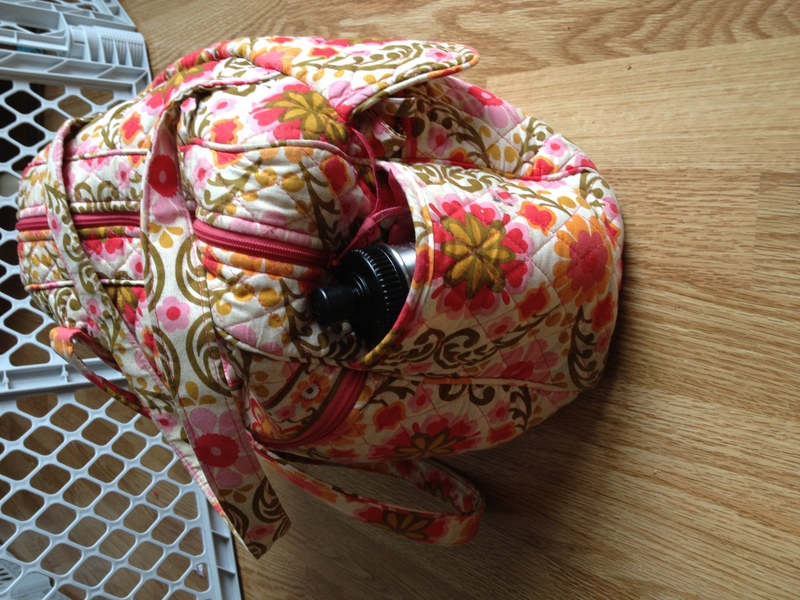 I love the Vera Bradley look and all my extra little bags inside. Sometimes there is more in my bag, like toys for the girls (though Capri now carries her own little bag with things to entertain her), extra snacks and other random items. So that is what is in my diaper bag.